What makes it special: The Villager wagon was produced and sold by Edsel from 1958 to 1960. Like the two-door Roundup and premium Bermuda station wagons, the Villager was initially built on a 116 in wheelbase shared with Ford’s station wagons, and, throughout its lifespan, shared Ford’s wagons core body stampings. The Villager and the Ranger were the only two model names that existed throughout Edsel’s three-year life span as an automobile marque. The Villager represented the lower trim level available within the Edsel brand for station wagons, but differed from the two-door Roundup by being offered in six and nine passenger styles. The Villager was available in a four-door configuration only. 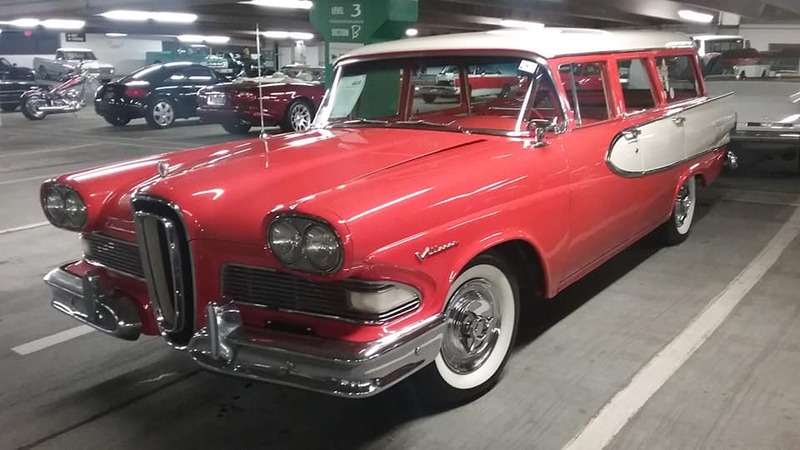 What made it famous: To differentiate the wagons offered by Edsel from their Ford counterparts, they were fitted with Edsel’s front fascia and grille assembly. The wagons also received unique boomerang-shaped taillights for 1958. In terms of interior and exterior trim, standard features included black rubber floor mats, ashtrays, cigar lighter, arm rests, chromed rear-view mirror and crank-operated rear windows. Like all other Edsel wagons, the Villager came with a two-piece tailgate. Seat belts were optional. All 1958 station wagons shared the Ranger’s engine choices, with a 361 cu in V8 as standard. All wagons came with a 3-speed manual transmission. Buyers also had the option of a 3-speed automatic transmission with a standard column-mounted gear selector, or during the 1958 model year, they could choose Edsel’s highly touted but trouble-prone Teletouch automatic, which placed its drive-selection buttons in the steering wheel hub. Why I would want one: You don’t see too many Edsel’s nowadays, let alone a wagon. Most find the Edsel to be an ugly vehicle, but I enjoy its uniqueness. Fun fact: The Villager name resurfaced at Mercury on a wood grained Comet station wagon from 1962 to 1967, and on similarly trimmed wagons in other Mercury series, including the Montego (1970–1976), Bobcat (1974–1980 Canada, 1975–1980 U.S.), Cougar (1977 and 1982), Zephyr (1978–1981) and Lynx (1981–1984).